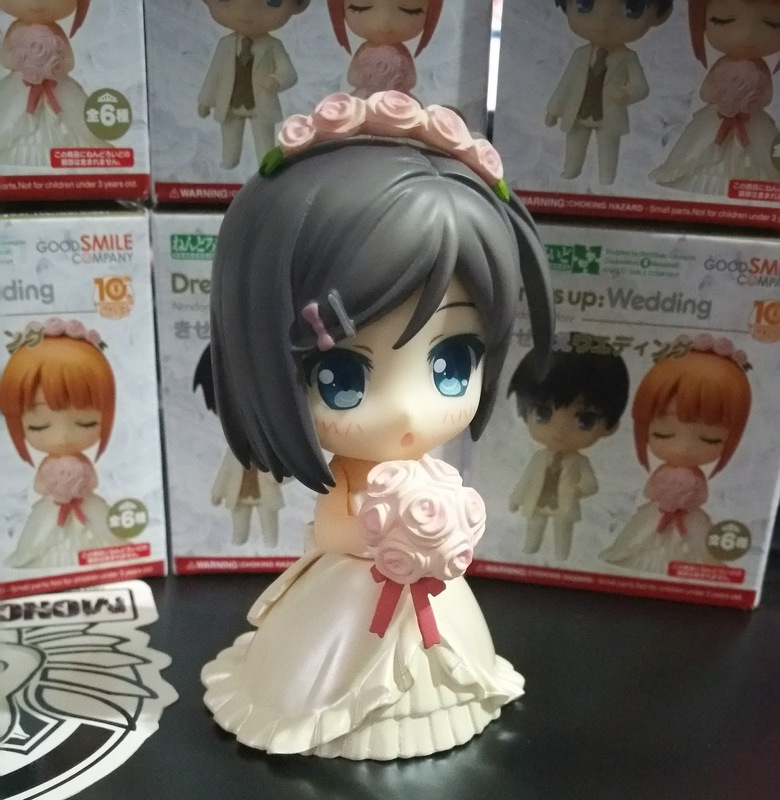 Figure Unboxing and Review: Nendoroid More, Wedding Set (Part I: Wedding Dresses)! After a long period of examinations and flu, I've finally gotten enough energy to open one of my packages that arrived sometime ago---the Nendoroid more Wedding set! This is a set that was popular since it's first release and the re-release did rather well too. Of the newer Nendoroid more sets, I'm ordering both the suits and halloween sets so look forward to reading my review for that! In addition, please note that there are 4 outfits here for females and two for males. I will be reviewing the 2 wedding gowns first, then the two tuxedos and finally the two ball gowns. It will be a long ride but I hope you'll bear with me. To prevent this section from being too repetitive, I'll focus on one aspect of the box every article. For this first section, I will be covering the outer box. On the front cover alone, we see a lot of information about this line. 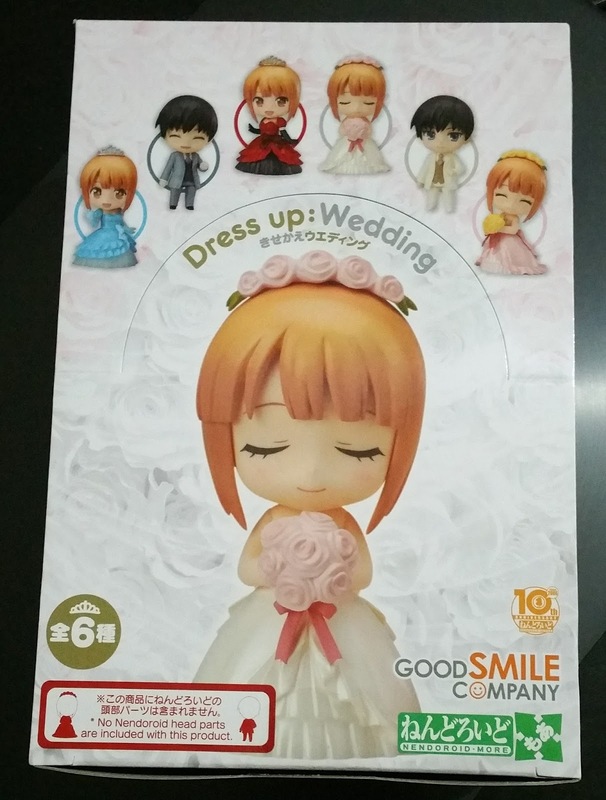 It gives the name of the series (Nendoroid more), the company (Good Smile Company), the event (10 year anniversary) and the number of figures in total (6). 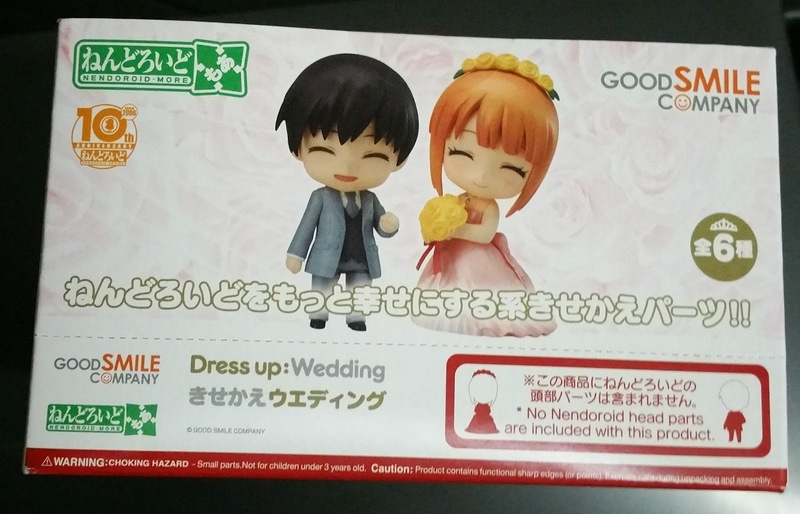 However, I would like to draw the attention to the red text at the bottom left corner, which explicitly mentions what will be in the box: the wedding gowns and flower crowns, the ball gowns and tiara, and unfortunately, just the tuxedos for the males. On the front of the box itself, we see an enlarged version of the "main character" which is the white wedding gown, as well as a smaller print of the other variants above her. This is how GSC usually handles their Nendoroid more boxes. 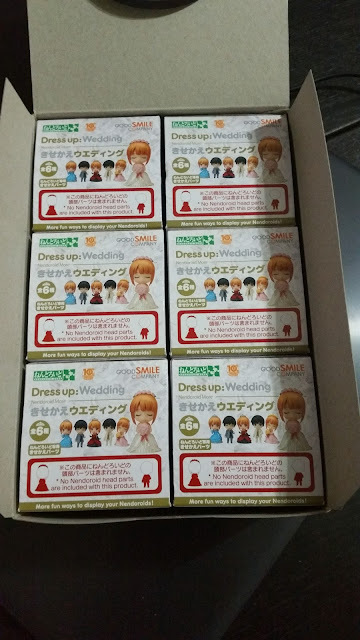 Furthermore, this outer box can be folded and torn to make it look like the ones you find in stores where they sell these as blind boxes. 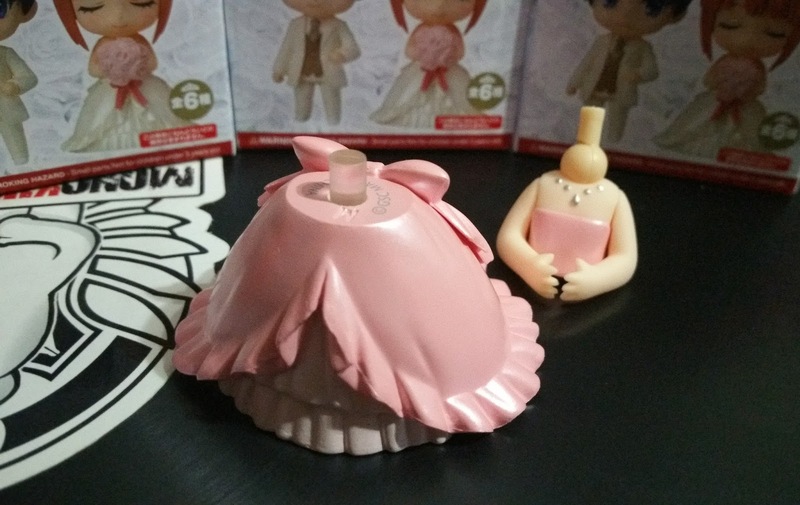 Looking at the other sides of the box, we see the variants again as well as more repeated information how the head of the Nendoroid is merely for illustration purposes and isn't included. GSC probably got a lot of complains about these "missing" heads when they released the first few sets. Opening the larger box reveals these 6 smaller boxes inside them. If you frequently play blind boxes, you'll know how these look but for those who don't, I'll cover how they look and how the interior packaging is in the next article. 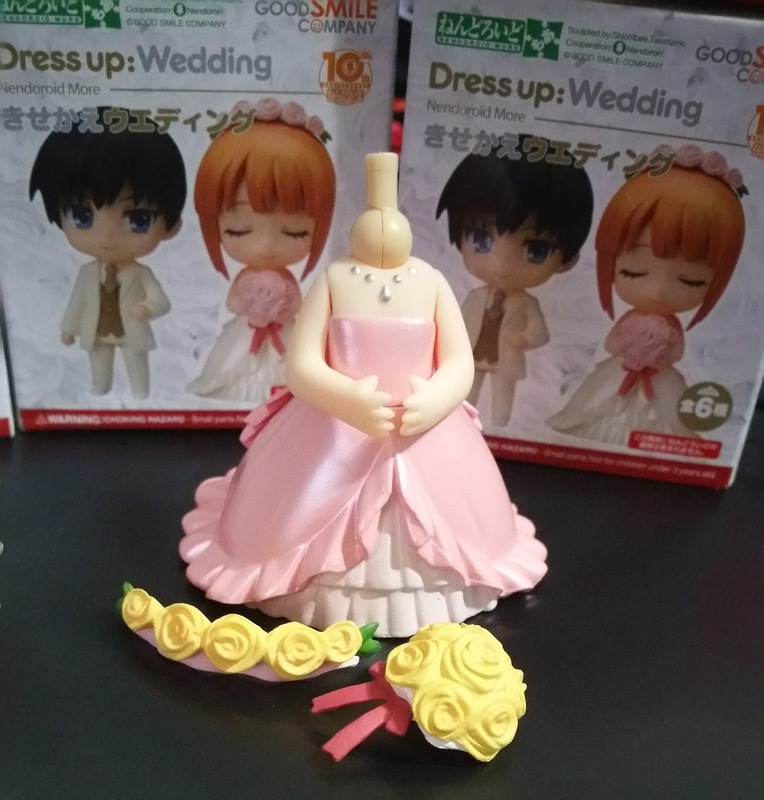 There are no bases for these two wedding dresses as the figures are capable of standing on their own due to how wide the skirts are. You can place them on regular bases though, if you are fearful of dust from your glass display like I am. There are bases for the tuxedo versions, though that is a discussion for another day. Let's look at what each individual piece contains. First, let's take a look at the white wedding gown! Note that she also comes with a neck joint but I have removed it for these photographs. From the image above, you can see the three parts which this figure comes with. The wedding gown itself, the flower bouquet and the flower crown. The flowers that are supposed to come with this set are in light pink but I personally find the pink too faint and that the yellow ones (that come with the pink wedding gown) suits it more. A closer look at the wedding gown and we can see that it comes with three layers to the skirt part. The first forming the inverted V shape and two more straight layers below. The ruffles are all done with precision and all look genuine even though they are shrunk down to this size. I particularly like the ones at the tip of the V-shape, which show a very good flow of motion. 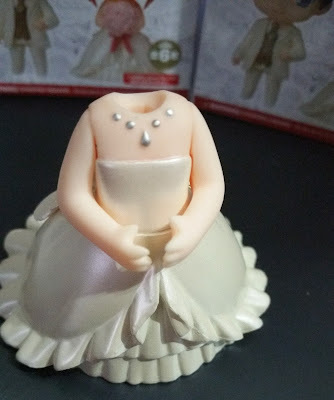 The stretched out fabric at her hips until before the ruffles look very ballooned out, similar to how this wedding dress would look if it exists in real life. The accessories at her neck area are quite defined as well and everything is painted with this pearl paint that makes them all shine and look extremely elegant. This next image shows how the gown can be broken down into three different components--the top, the skirt and her legs. For the top, her hands can be removed and possibly interchanged with other Nendoroids that have sleeveless shirts. However, the angle of her hands must be kept rather similar to the above if you would like her to hold the bouquet as the bouquet does not come with a peg into either hand, but a stick that is balanced between the two. I'll cover more about this in a later section. Moving back to the gown, you can see the back of the skirt part in the image above. The ruffles are really immaculate, even though it is at the back. The flow of the fabric is made even more visible now, as it goes all the way down to the floor. We can see the creases in the fabric clearly. Lastly, I would like to mention the ribbon which holds its shape well against the dress. 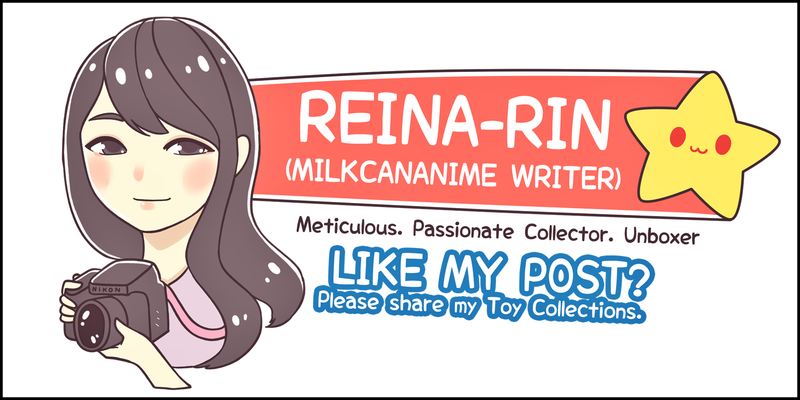 I felt like the ribbon part could look a little softer to make it seem more realistic. However, I enjoy looking at how there is a crease on the dress at the part right below the bow as it makes it seem like the bow exerted weight on the dress, thus causing the crease. Because it has been my long time dream to see Tsukiko in a white wedding dress, I took the chance to put her in this one too. The light pink suits her too, since it fits her gentle personality and her hair accessories. The light pastel tones help her blue eyes pop as well. However, there are 2 main flaws which I noticed. 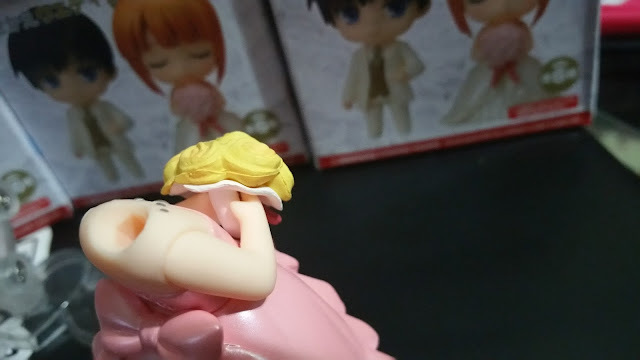 Firstly, the flower crown may not suit all Nendoroid heads perfectly. Every girl has her own unique hairstyle, and that is even more pronounced in the bizarre designs in the animeverse. As you can see in the image above, Tsukiko's head isn't pointy enough at the top to match the shape of the flower crown, thus making it look as it it is hovering a little. Though, this isn't a huge problem if you don't actively pay attention to it. 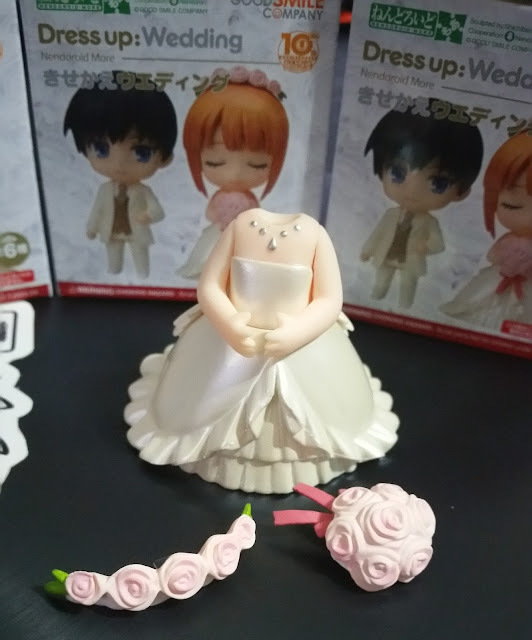 Secondly, the skin tone of the wedding set might not suit all figures. As in real life, we have fairer people and tanner people. Unfortunately, Tsukiko is one of the fairer ones and I can definitely see a difference in her skin tone (face) as compared to the wedding set's skin tone (arms). The difference is even more pronounced in real life. That being said, I think most of the other Nendoroids would suit this wedding set's skin tone. 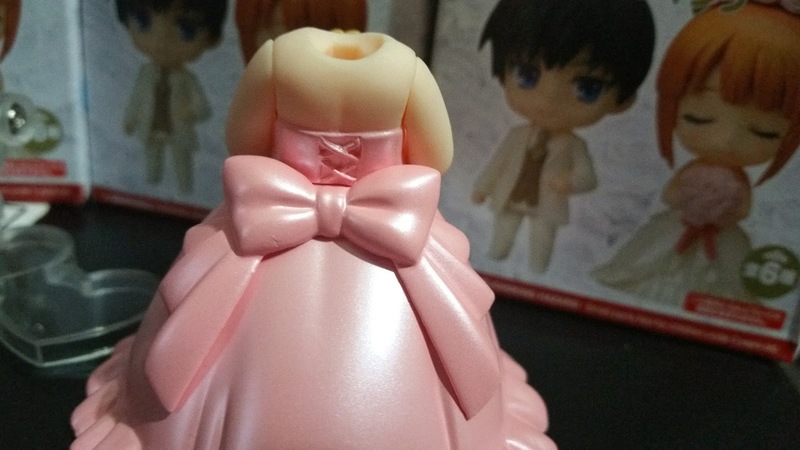 Next, let's move on to the pink wedding dress. This pink wedding gown also comes with similar things--the gown itself, the flower bouquet and the flower crown. From this image above, we can see some parts clearer, such as how the flower crown comes with its own pink lining at the back. This makes a stark difference from the white set, which of course, comes with white lining instead. Do note that the yellow here is much brighter than the light pink for those in the white gown set. This is also a reason why I think it would be better matched with the white set instead, as the color would pop more than if you use the official pale pink ones. However, that would leave the pale pink ones to be used with the pink wedding gown, so be sure to make your choice wisely. By now, you would have noticed that both wedding gowns use the same sculpt and due to this being so, I would like to focus on a different area that I left out in the white set--the back of the gown. Look at the part above the bow and you see two criss-cross lines. That's how they look all laced up. The "strings" are all sculpted and painted on, so you can totally see the effort spent into making these. The shoulder blades above that corset-like part is done quite beautifully too. The sculpt is done gently, enough to make it look realistic, but not overly exaggerated. Breaking down the figure to three parts again, we now see how the connection holds for the gown. This time, I have left the neck joint in the top in, because it can be quite difficult to remove the joint for some of them. For the skirt part, you can see that unlike the white wedding gown, the lower two layers for the pink are painted in a different way. They are painted in a duller, matte pink. This adds another layer of texture to this figure because we can now see two different shades of pink, to separate the outermost material from the two inner layers. 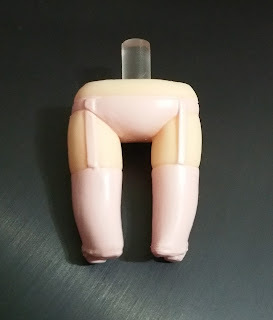 Likewise, the pink gown also comes with its garter-belt and this is in light pink. The exact shade is quite similar to the flower bouquet in the white wedding set. Perhaps due to the color, the garter-belt here looks more matte and dull than the one in the white gown. Now,, we'll take a look at the stick part of the bouquet I mentioned earlier in this article. If you look closely, there is a rod-like part extending from the flowers towards the figure and that is held in place by the hands. As there are no pegs from the bouquet into the hands, the bouquet has to be kept at a similar angle to ensure that the flowers are held properly and will not fall. 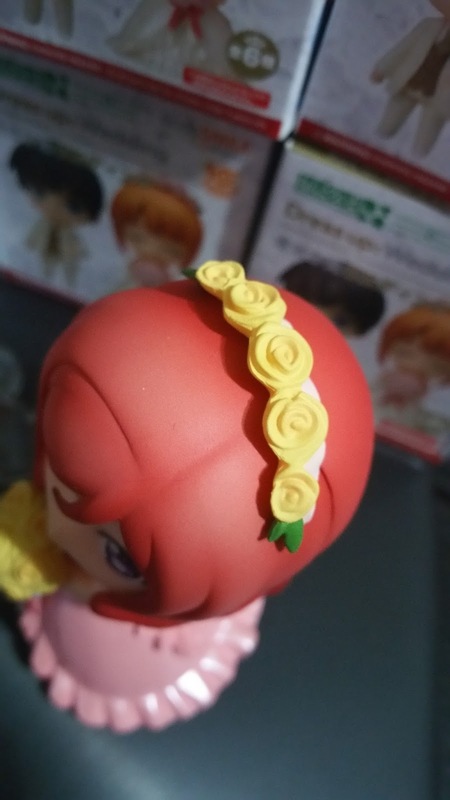 For the flower crown, the argument about it not fitting all figures hold as it is still unable to fit perfectly on Nendoroid heads with a unique cut for the front and back hair pieces such as for Maki. 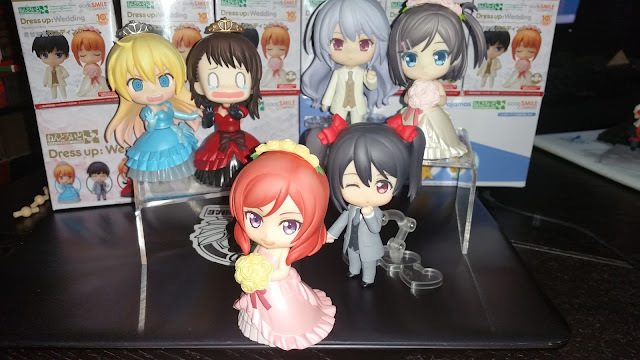 However, it appears to leave a smaller gap between the crown and the Nendoroid head for Maki than for Tsukiko. Despite so, I am skeptical whether it will fit well on Kotori, with her hairstyle, but I'm not intending to try it out yet. 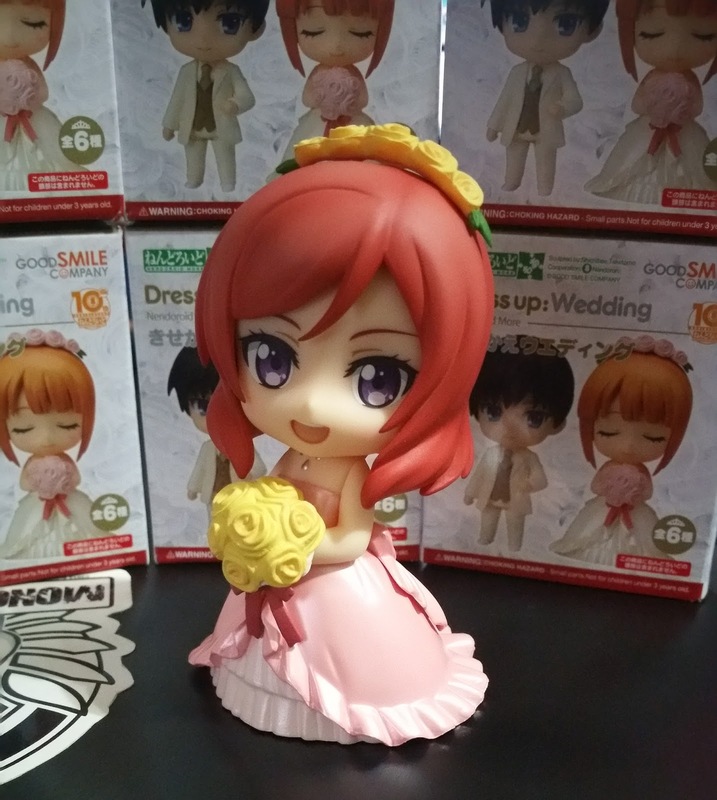 Here is Maki in her full wedding glory! Next up, I'll be covering the two tuxedos from this set so stay tuned for that! 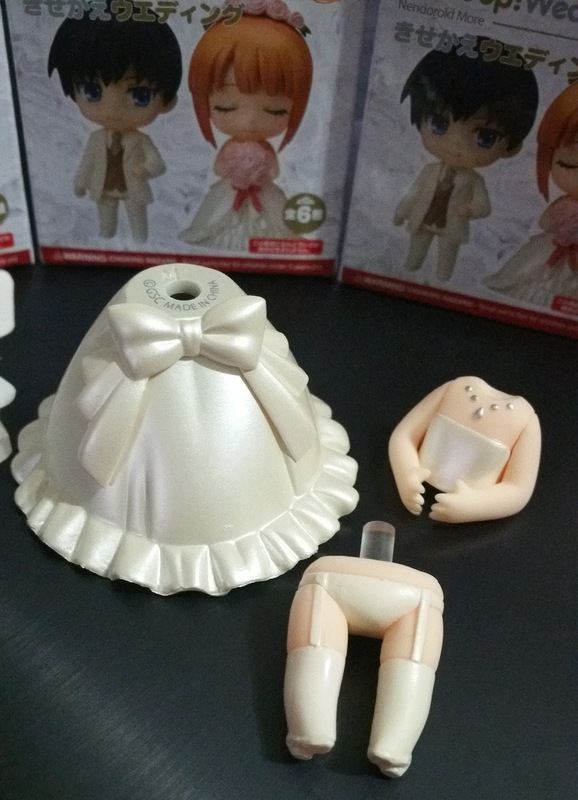 No Comment to " Figure Unboxing and Review: Nendoroid More, Wedding Set (Part I: Wedding Dresses)! "